The quest for peace between Israel and its neighbors in the Middle East has captured the attention of the world media for decades. However, and much to the dismay of those who have placed great hopes in the ongoing peace process, the frequency of war has only increased in recent years. How do we explain this anomaly? Frequent terrorist attacks on Israeli civilians have emboldened the Palestinian Authority as it demands a new Islamic state called Palestine. World leaders irritate Israel by jumping aboard the Palestinian ship as it sails to statehood. The diplomatic efforts frantically continue, but the Hamas, Fatah, and Islamic Jihad terrorist organizations persist in their calls for Jihad, or holy war, against Israel. Why have the seemingly endless efforts for peace borne so little fruit? How can a truly lasting peace be achieved? 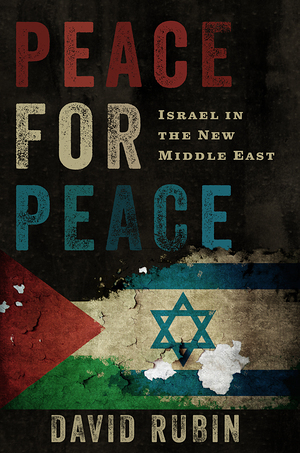 In Peace For Peace: Israel In The New Middle East, author David Rubin exposes the false premises on which the peace process and peace plans have been based, explaining the confusion about a patently failed process resulting in some thirty years of effort, billions of dollars spent, and thousands of lost lives. Describing the greatly promoted, yet disappointing summits and the various peace plans that have blown up in years of terrorism and recurring wars, Rubin goes on to describe the reasons why the great hopes of peace negotiators have not been realized. Finally, Rubin presents us with the framework for a bold, practical peace plan, entitled Peace for Peace. With comprehensive analysis and lucid description, Rubin shows us how Peace for Peace, which combines historical justice and common sense, can bring a realistic and lasting peace to this fascinating, but troubled part of the world.